The Rose Bowl has been awarded every year since 1947. 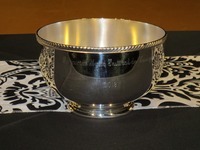 The Porcupine Music Festival de Musique would like to thank Flondra Jewellers for their generous donation of the Rose Bowl. Each year the Porcupine Music Festival de Musique awards the Rose Bowl to one participant for demonstrated overall musical excellence throughout the Festival. It is accompanied by a $1000 scholarship.